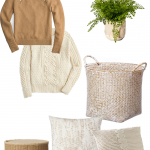 So, not to rush summer out or anything, but I am super excited about fall. Not sure if it’s the crazy hot heat or the fact that I just love wearing sweaters and boots but I’m ready. 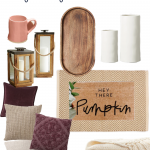 For my fall decorations this year I want to bring in some non-traditional colors. 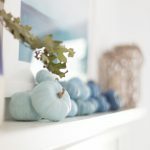 I like using blues in my everyday decor, so it kind of just makes sense and everything can transition pretty easily. 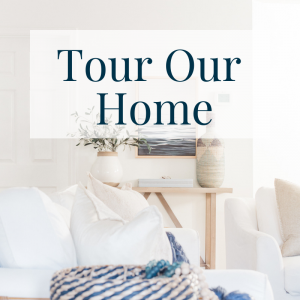 I’m also excited about the idea of painted things non-traditional colors. Like leaves. 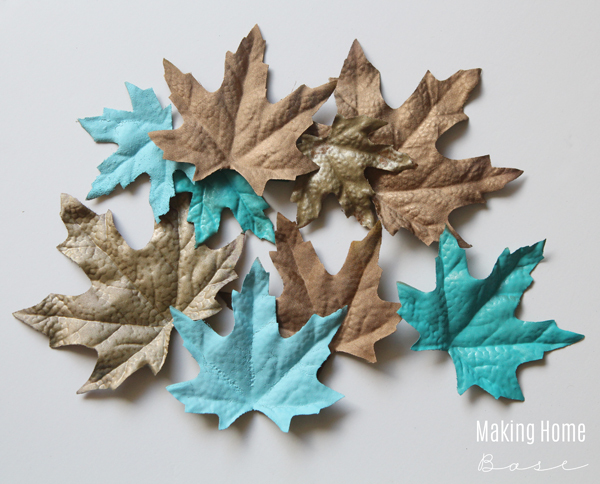 In an afternoon you can make leaves any color you want and it’s a fun fall craft too. 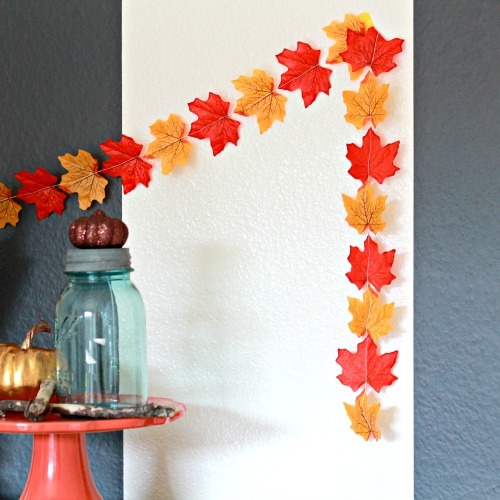 If you enjoyed my fall garland, you guys are going to love this super simple fall decorations. 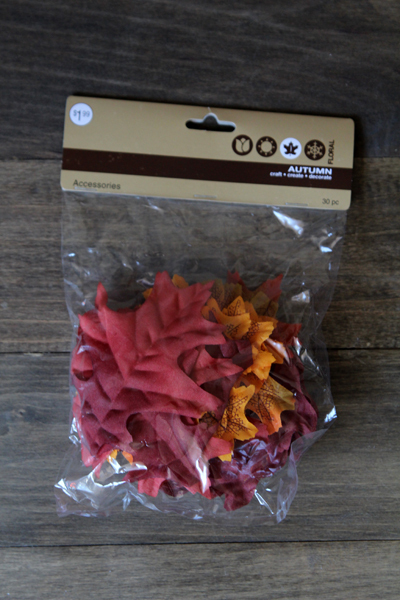 I snagged this bag of faux leaves (affiliate link) for just a few bucks. There is a variety of sizes and colors (which totally doesn’t matter since they are all getting painted, anyway). I laid them out on four pieces of cardboard making sure I got a good mix of sizes in each group. Then I went a spray painted each group a different color. It took me less than 10 minutes to spray them all. You want to do this on a day when it’s not so windy because the leaves are really light and tend to get picked up easily (clearly, I attempted this on a windy day – it was a disaster). 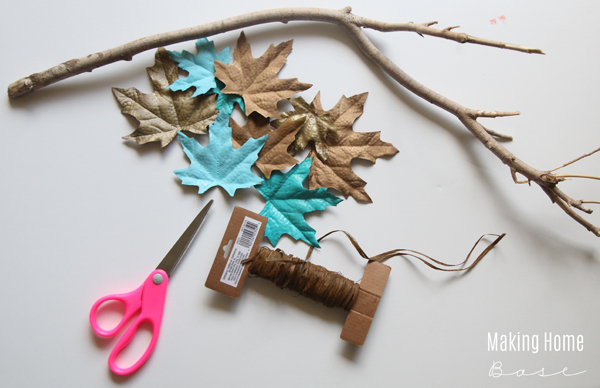 After the leaves were all dry I wanted to string them up on large twigs to create large scale fall decorations. To do this I gave each leaf a very small cut (you could use a hole puncher if you have one handy) just to create a little hole to string some raffia through. I tied different lengths of raffia to different leaves and tied and the other end to the twig. No measuring, I just kind of eyeballed it. Currently, this is hanging above my chalkboard. I love the black background since it really makes the color of the leaves pop. Also check out the faux leaves garland you can whip up in 5 minutes for just $1! I love, love, love this, Chelsea! What a great idea Chelsea! I love the paint colors and that branch against the chalkboard. Very pretty. Very cute! I really like the blue. It’s non-traditional, but it totally works. Visiting from The Maker’s Link Party! Thanks so much for stopping by, Natasha!! Verryyyyyyyy cute, and so unexpected with the blue. Gorgeous. I love this! I was just at the dollar store looking at faux leaves and wondering what could be done with those ugly things. 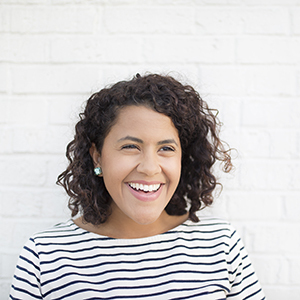 You have inspired me…and I can save a few bucks too! Chelsea! You are a genius! These are AMAAAZZZING! I have a few bags of leaves I tried to find a place for last year, but I hated the colors and they didn’t match anything. Now I know what to do with them! Such a great idea and I can’t wait to try it. This whole project is perfect… right down to the chalkboard background! LOVE! 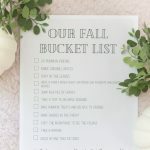 Such a cute and fun idea, Chelsea! Love it! Love it so Pretty! 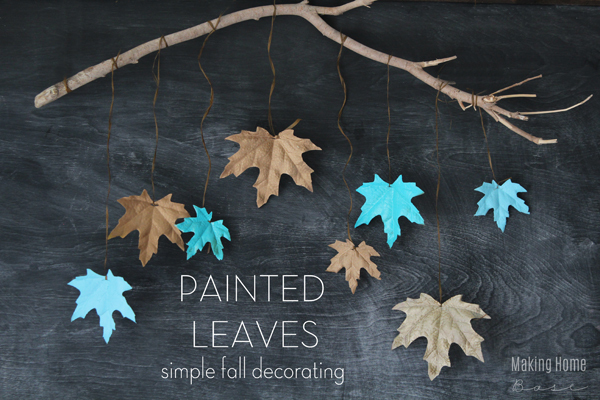 I bought leaves and painted them Too. Love this girl! So pretty! 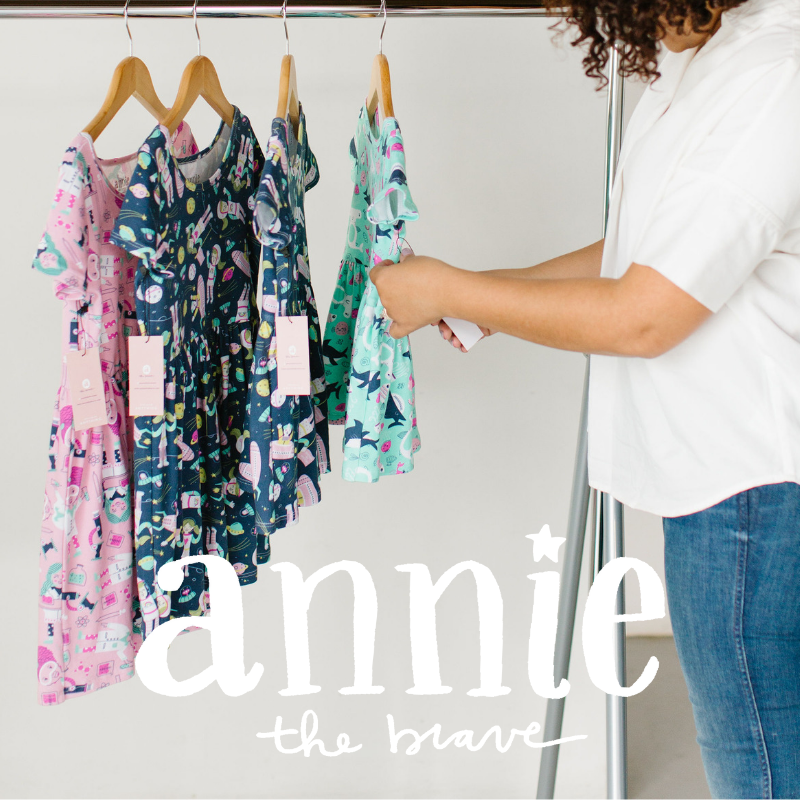 Thanks for linking this up to The Creative Collection Link Party!